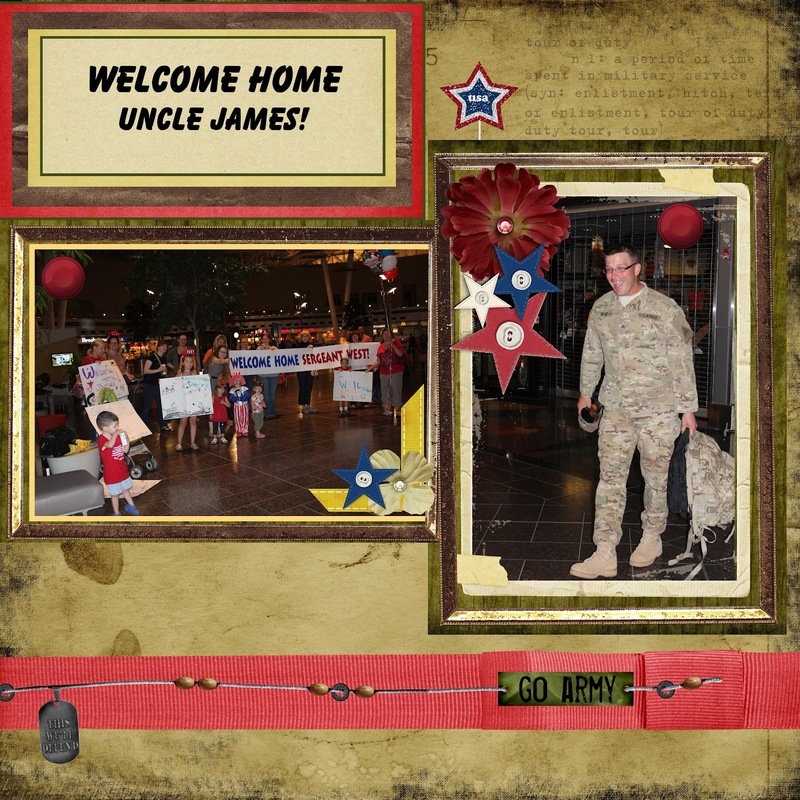 Last night, we welcomed my Brother in Law, James Home from Afghanistan. Technically, he's been in the states for 2 weeks, in Texas, debriefing, and getting a place for Lisa who is going to move down there at the end of August. But he came home to his family last night. Happy Night. And my sister got a crazy idea. She invited a bunch of friends and family down to the airport to Welcome Home. So we decked up in our Patriotic garb to meet her. We found quite an outpouring of love when we arrived, friends I'd never gotten to meet, but could tell I would like just by the way the showed affection towards James and Lisa by coming out to the airport to be crazy, make signs and greet a plane, to make a soldier's homecoming a happy one. Christopher made his own poster for Uncle James. In case you can't read it, it says Welcome Home Uncle James. Then he started drawing his own Action poster. Here's his explanation of it: "Oh my gosh, I'm getting out of here!" I bet a lot of Afghani bad guys said that. Meanwhile, there were many kids, wreaking havoc, and having fun. Lisa brought the girls with their own Festive Garb to wear to welcome Daddy home. Annie was all decked out like Uncle Sam. And Charlie was the little Sergeant West. Wonder where she gets that Don't Mess with me face? To kill time, the kids got to running around. Circling. Circling. You knew someone was going to wipe out, it was Charlie, just as Eric snapped this one. But don't worry, she was fine, hopped right back up and got back to Crazy. A little Action from the Littles while we were waiting. 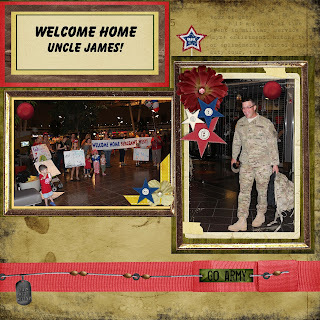 Sophia made this great poster for James, demonstrating all the amazing ways James and his crew got the bad guys in Afghanistan. James texted that he landed, so we all got ready and lined up. It cracks me up that Sam's poster is upside down. Annie is all ready with the poster she made. This was our group. All ready for James to arrive! As Lisa said, Remember the time James was late to his own party? Yeah, ever the gentleman, he was last off the plane. And the kids were so antsy, they were all over the place, Sam even said, "I'm so tired." And he sat in the stroller...for about 3 seconds. And if you can watch that without crying, I triple dog dare you. I can't, and I've seen it a bazillion times, and I was there, and something gets me every time, whether it be Lisa wiping her eyes, James look of Joy and Surprise, or simply the way the kids go charging up to him. Gets me every time. After the initial welcome, the Happy Family of 4 continued to take over the airport with more Celebration. I just love this. The cake is a running joke from the last time he got deployed. The kids were like locusts buzzing around while James cut the cake. Seeing this bag makes me bittersweet. It's a symbol, being at the ready, ready to leave when Uncle Sam calls. However, it's a sign of Bravery for me too, few sign on for this duty, to protect and serve. It's hard on those left behind. But we are Gifted with peace and safety provided by those who carry the bag. Lisa couldn't stop hugging him. It was a Beautiful sight. I'm so happy he's home, and that next time they go with him, so for a fat long time, they don't have to let him go. I hope they get tired of each other, really sick and tired, maybe even find some annoying habits. In the mean time, I hope he puts on 20 pounds from my sister's amazing cooking.